I felt uncomfortable about female bodybuilding. Until I met Taylah. I arrive to a sight of rippled muscles, the pungent whiff of fake tan, a very energetic DJ and lots of yelling. 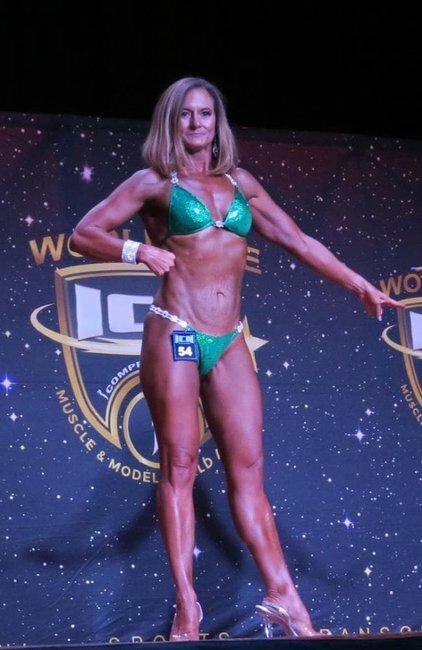 Two weeks ago, I wrote a story about Natalie Joyce’s appearance at a bodybuilding competition. She looked incredible. But more importantly – she looked confident and happy. After the humiliating and public affair her ex husband former deputy Prime Minister Barnaby Joyce had with his staffer, I was totally here for Natalie taking back her power in whichever way she saw fit. Natalie on stage in the iCompete fitness modelling competition. Image: supplied. But I can’t say it eliminated all of my upwards nose turning at the sport of bodybuilding and fitness modelling. I admitted this while on the phone to the NSW State President of iCompete Natural, the competition Natalie was a part of, and so he challenged me to come and see it in the flesh. "Don’t judge it until you’re in it," he told me. "A lot of the women here have been through trauma or abusive relationships. This is something they can do just for them, and it makes them feel powerful. Many of them only come for one competition and then give it up," Rab Mehajer explained. The next competition was being held at the Australian Fitness Show at Sydney’s ICC, which is basically a who’s who of everyone in the industry. I walk past signs for keto, cryo and tooshie toning ( yes, really) and finally find myself at the ICN stage. I&apos;m already feeling a bit... well, over it. I love exercise, I’m a big fan of it actually. But this environment feels like every flavour of fitness I try to actively avoid. Within an hour of settling in to watch my first ever fitness modelling competition, I&apos;m overwhelmed. If I&apos;m being completely honest, there&apos;s something about it that seems degrading, and a bit... weird (the muscle poses they contort into are very odd). The extent of fake tan feels next level ridiculous, and I don&apos;t like the way the judges make the ‘losers’ stand on the back wall while the ‘winners’ claim their prize. These women are &apos;losers&apos; purely because their bodies don&apos;t look as good as the others in their lineup. I find it all a bit.... ick. That’s until I meet Taylah. Learning the ropes from my new friend Taylah. Image: Supplied. I interrupt the 22-year-old during her post show comedown. "Um, please tell me, why?" I ask. She immediately senses my distaste. She smirks, knowing she&apos;s about to blow my judgey ways out of the water. "Two years ago I weighed more than 108kg and they wouldn’t let me skydive, because you had to be under 100kg. "I was determined to get on that plane so I started working out and fell in love with it. I am now a personal trainer and I have never been happier, more content or more strong in my life," she says. "My body wasn’t ‘bad’ necessarily," she says, reflecting on her bigger self. "But I was unhealthy, I have heart issues. For me it could have been a life and death decision [not to lose weight]," she says. "I was suicidal and an alcoholic. Now, I am motivated, healthy, and loving my life," she adds. Sidenote: Here are some tips on how to improve young girls&apos; body image. Post continues after video. But this competition is the ultimate extreme of "healthy". Here, entrants push their bodies to the limit. I need to understand why, and Taylah is more than happy to let me into her world. 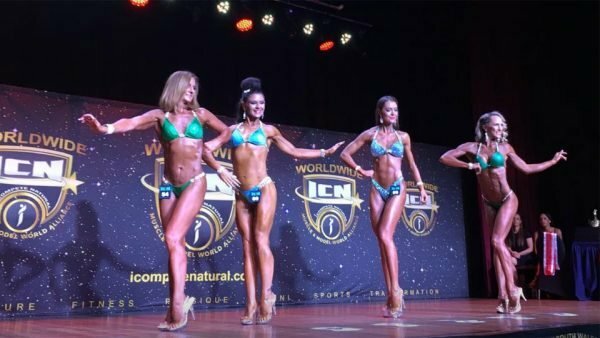 They train religiously and ‘restrict’ their diets for 12 weeks prior to competition, she explains. Three days before, they stop exercising altogether, and 20 minutes before they ‘pump up,’ which basically means they lift all the heavy things to make their muscles look plump on stage. For one week prior to the competition, Taylah ate fish and beans six times a day. She stopped drinking water 18 hours before, and for breakfast on comp day - she ate steak and potato. She also had four vodka shots backstage, to help dehydrate her muscles. This is her comp bag. 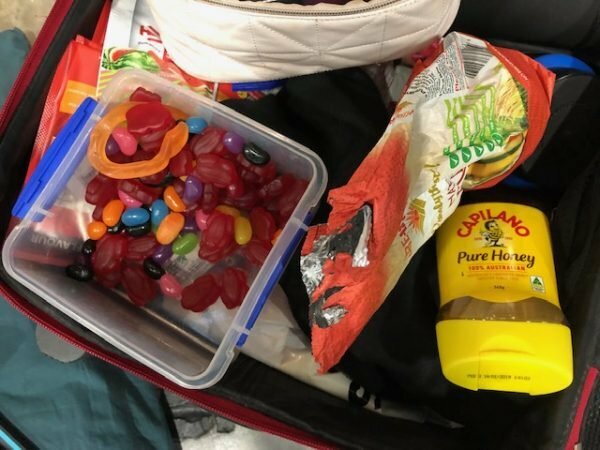 She snacked on lollies and crackers with honey to boost her energy. Taylah&apos;s competition snacks. Image: Supplied. "But this is all temporary," she stresses. "It’s for the competition, not forever." "Of course this isn’t healthy long term. But I’m competing." After the competition, she explains that she and her boyfriend have plans for pizza, and a visit to the peanut butter bar to celebrate. "I’m a chef... I love food. But right now it’s fuel," she tells me. When it comes to the... shade of tan, I tactlessly ask my new friend; "um, do you realise you are all very, very...orange?" 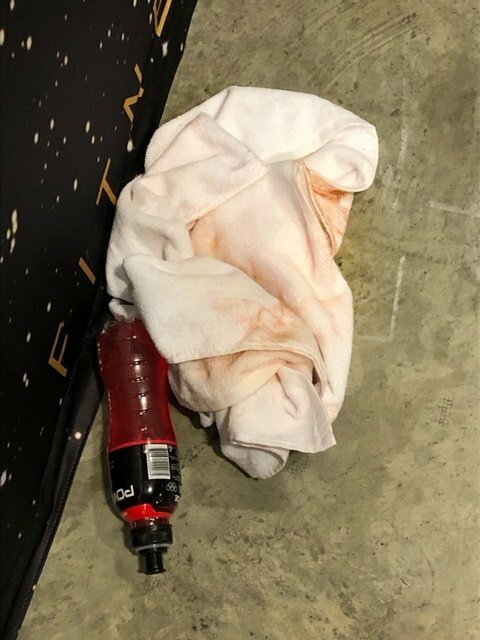 There were a lot of towels that looked like this.....Image: Supplied. She laughs. "We have to go as dark as we can to show our muscle definition. This isn’t to look good, it’s for the judges to see our bodies." I push harder; what about when you don’t win? Doesn’t that hurt? It’s a literal judgement on your body, no? "It just drives me to work harder when I don’t place. I don’t take it as an attack on my body," she shrugs. At 22 years old, Tayla talks some big talk about body image. She is grounded, confident, friendly and warm. She is also the first to high five her fellow competitors on their successes. It&apos;s a community, a place where everyone has a shared love for getting, well, super ripped. 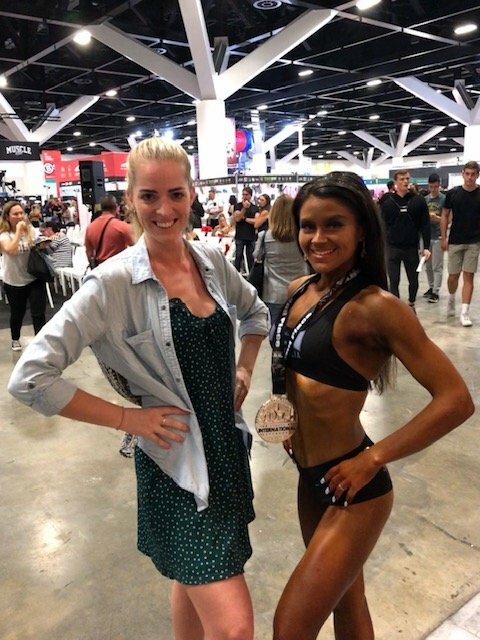 This is only her second competition, her first was two weekends ago - she was the one standing directly next to Natalie Joyce in the photos that were splashed across Australian media. Natalie Joyce and Taylah are far left. Image: iCompete. Two women, who have been through life changing experiences and ended up on that stage side-by-side, beaming. As a spectator, the competition is easy to judge. I found it hard to comprehend. But most of the people on that stage have a story of sheer triumph to tell. When you look beyond the fake tan and the tricep poses, these women are dedicated, competitive, and in it out of passion for the sport - and more importantly for the way it makes them feel. Powerful, in control, and confident. Who are we to judge that? Have you ever been to a bodybuilding competition? What did you think?